Elm-Cap Industries, and the Abbate family, have been serving families in Connecticut since 1947 when Pio (Pete) Abbate, a machinist from New Britain, purchased a burial vault company in West Hartford that was organized in 1928. Pete operated as an independent vault manufacturer until acquiring the Doric franchise in 1970. Pete became president of Doric in 1974 and retired in 1978, leaving leadership of the Captial City Burial Vault in the capable hands of his son, Roger Abbate, a life long vault man. In 1978, Roger, saw an opportunity to expand and merged with Elmore Company to become Elm-Cap Industries. The Elmore Co., established in 1914 by Starr Elmore, made the first concrete burial vault in the basement of Elmore's home using a wooden form, mortar box and a hoe. Starr also delivered the first vault via horse and wagon for the Watkins Funeral Home. In 1933 Elmore Co. became the 27th licensee of Wilbert Funeral Services. Elmore Co. was run for many years by Marjory Stevens and then by former Wilbert Manufacturing Association president Richard Elmore until his retirement in 2000. Roger and his son, R. Thomas (Tommy) Abbate, continued to run the business while keeping abreast of many changes in the industry. Significant increases in families opting for cremation, as well as the increased demand for more burial vault personalization have helped Elm-Cap define enhanced products and services. Additionally, Elm-Cap is a provider and fabricator of concrete products for the utility industry. When Roger passed in 2006, Tommy, a life long employee, became president of Elm-Cap. With the help of great employees and a dedication to meeting the ever changing needs of today’s families, Elm-Cap continues to evolve. In 2007, Tommy was named a Director of the Wilbert Manufacturing Association (WMA). The WMA helps make the industry responsive to its customers needs – from the licensee to the funeral homes to the families. Elm-Cap Industries is proud to represent Wilbert as we serve our families throughout their time of need. In 2009, Elm-Cap became a franchisee of Paws & Remember, a grief support and cremation service for pets. Paws and Remember was started by Wilbert licensee Mark Minnick of Ft. Wayne, Ind., and is another way we strive to meet the needs of our families as they deal with the sadness associated with the loss of a loved one. 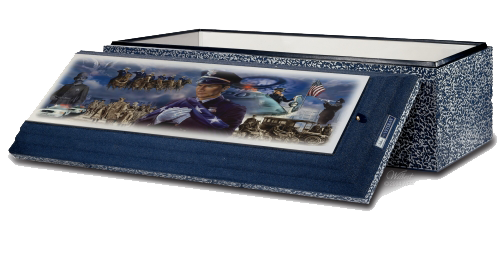 Elm-Cap Industries offers Wilbert burial vaults and creamation urns to Hartford and Middlesex counties in Connecticut and to the city of Rockville in Tolland County. Wilbert offers two types of burial set ups, Wilbert Way (WW) and Ovation, and Above Ground with Lowering Device (AL). Both set ups consists of an above ground seal and a lowering device, also known as The Wilbert Way Lowering Device. The difference in the two set ups is in the placement of the vault and the vault cover during the funeral service. The Lowering Device and Greens setup includes graveside grass and casket lowering device. A 16x16 tent is available to be set up by our staff at the gravesite for funeral services. The tents cover the burial area and provide a comfortable place for families to gather during the funeral. Six chairs are provided for each definite tent. Nameplates give burial vaults a personalized touch. They are a standard feature of our Monticello burial vaults and above. Nameplate includes the name of the deceased and the birth and death dates. Wilbert Burial Vault provides disinterment services. If it becomes necessary to move a burial vault from one location to another, Wilbert can assist with the disinerment service. We handle everything from locating the burial vault to relocating the burial vault to a new location. Vault Transfer is a service available between Wilbert licensees and dealers. Wilbert Burial Vault uses the vault transfer service when a burial request has been made outside of the licensee territory. The location of the cemetery is needed to determine the appropriate Wilbert licensee or dealer. Since the services offered by each Wilbert licensee vary, the licensee work together on a per burial basis to determine the services, such as tents, grass, and chairs that each licensee will provide for the burial. Wilbert Funeral Service (corporate HQ) has awarded Elm-Cap Industries with "Ultimate Service Provider"
There are four service levels: Minimum Service, Basic Service, Premium Service, and Ultimate Service Provider. To be classified as an Ultimate Service Provider, one must receive at least 75 points out of 88 points; a higher score is attainable when bonus points are earned for exceptional achievements. Points are collected by category, including tents, chairs, greens, Wilbert Way, lowering device, vaults, employees, and trucks and delivery. Elm-Cap Industries surpassed the 75 points needed to obtain Ultimate Service Provider.